Director – Matthijs van Heijningen Jr., Screenplay – Eric Heisserer, Based on the Short Story Who Goes There? by John W. Campbell Jr, Producers – Marc Abraham & Eric Newman, Photography – Michel Abramowicz, Music – Marco Beltrami, Visual Effects Supervisor – Jesper Kjolsrud, Visual Effects – Image Engine & Mr X. Inc (Supervisors – Dennis Berardi & Aaron Weintraub), Additional Visual Effects – With a Twist Studio, Special Effects Supervisor – Mark Appleby, Creature/Makeup Effects – Amalgamated Dynamics (Supervisors – Alec Gillis & Tom Woodruff Jr), Production Design – Sean Haworth. Production Company – Morgan Creek/Strike Entertainment/Dentsu Inc.
1982. Palaeontologist Kate Lloyd is engaged by a team of Norwegian scientists on short notice and great secrecy and flown to Thule Station in the Antarctic. It turns out that they have discovered an alien craft that has been buried in the ice for a hundred thousand years. Nearby they find the creature from the craft frozen in the ice and cut out the block and bring it back to base. That night, they are startled as the creature returns to life, blasting out of the ice and attacking people before they destroy it. In the morning, they go to fly an injured man away for treatment, when Kate becomes aware that something is not right. However, when she tries to flag the helicopter down, one of the men inside turns into a creature and causes it to crash. Kate works out that they are dealing with a shape-shifting alien that has the ability to absorb and replicate living cells and then transform into a duplicate of the original. They realise that anybody among the group could have been taken over and replaced by The Thing. They now face the problem of trying to find which of them is human and which is not. John Carpenter’s The Thing (1982) is one of the classic science-fiction films of the modern era. Although this was not the case when The Thing came out in the immediate aftermath of the massive success of E.T. – The Extra-Terrestrial (1982) and was ignored at the box-office, as well as receiving very divided critical press. Over the next few years however, The Thing‘s reputation grew, principally due to its’ wild and way out effects, which were the zenith of the 1980s fad for air bladder makeup transformations. It became a bona-fide cult classic and is regarded as one of the shining stars in John Carpenter’s oeuvre. The Thing was in turn a remake of the earlier The Thing from Another World (1951), a classic in its own way that was the very first alien invader film of the great era of 1950s science-fiction films. All three versions are based on the short story Who Goes There? (1938) by famous science-fiction pulp magazine editor John W. Campbell Jr. 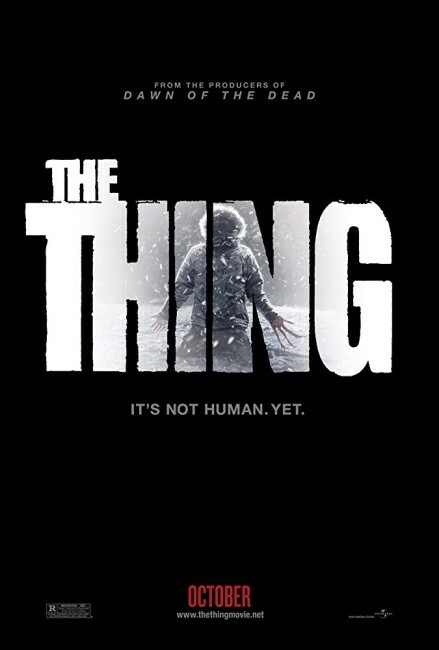 The idea of a sequel to The Thing has been sporadically announced over the ensuing decades with one version to have been directed by Rob Bottin, the creator of the way-out makeup effects in the original. This eventually emerged with The Thing 2011 that comes pitched amid the 00s fad that has strip-mined just about every 1970s/80s horror film as a remake. Others amid these include the likes of The Texas Chainsaw Massacre (2003), Toolbox Murders (2003), Willard (2003), Dawn of the Dead (2004), The Amityville Horror (2005), Assault on Precinct 13 (2005), The Fog (2005), Black Christmas (2006), The Hills Have Eyes (2006), The Omen (2006), Sisters (2006), When a Stranger Calls (2006), The Wicker Man (2006), Halloween (2007), The Hitcher (2007), April Fool’s Day (2008), Day of the Dead (2008), It’s Alive (2008), Long Weekend (2008), Prom Night (2008), Friday the 13th (2009), The Last House on the Left (2009), My Bloody Valentine (2009), Night of the Demons (2009), Sorority Row (2009), The Stepfather (2009), And Soon the Darkness (2010), The Crazies (2010), I Spit on Your Grave (2010), Mother’s Day (2010), A Nightmare on Elm Street (2010), Piranha (2010), Don’t Be Afraid of the Dark (2011), Fright Night (2011), Straw Dogs (2011), Maniac (2012), Carrie (2013), Evil Dead (2013), Patrick (2013), Poltergeist (2015), Suspiria (2018), Child’s Play (2019) and Pet Sematary (2019). The difference in comparison to these other remakes is that, though it shares the same name as the original, The Thing 2011 is sold as a prequel as opposed to a remake, telling the story of the Norwegians that we see in the opening scenes of The Thing 1982. That said, The Thing 2011 copies and conducts variations on most of the major scenes in the original such that it is a remake in all but name. Thus we have scenes where people walk through the base torching The Thing with flamethrowers; lock others in the shed; where the huskies are attacked; a variant of the walking spider head sequence but conducted on a much larger scale and so on. The Thing 2011 never copies the famous blood test scene but has a very similar scene where Mary Elizabeth Winstead conducts an examination of each person’s fillings (with The Thing now having developed the vulnerability of not being able to replicate non-organic parts that it never seemed to have in the first film). The result is not unakin to the big-screen version of Star Trek (2009) where the filmmakers appear to be conducting a remake/reboot of the original, yet are also trying to tie in elements of established continuity, resulting in the oddity of two versions of the same events that seem to happen in the same universe (here even straight after the other) with minor differences. At least in regard to continuity, the remake makes all effort to tie in and explain how the alien ship was found in a crater in the icepack, show the block of ice being dug out, offer explanation for images such as the two charred bodies melded into one and the man sitting at the chair dripping frozen icicles of blood from his wrist, while the end credits are interspersed with a set of scenes that tie everything up to the opening of The Thing 1982. The complaint one might make is that this has become a US-washed version of the events leading up to the first film – a term this author has coined to refer to films that remake or adapt a foreign original and rewrite them with generic American locations and characters presumably because American audiences are so xenophobic they are unable to handle the sight of foreign places and people. While the film does take place on a Norwegian base, the remake writes in American leading characters and has English spoken for the bulk of the film in order to carry The Thing 2011 to Middle America. To its credit though, the film (which comes from a Dutch director) has employed a number of Norwegian or at least Scandinavian actors and has the supporting characters speaking in Norwegian for a reasonable part of the film. All of that said, The Thing 2011 falls into the same set of problems that almost all of the abovementioned remakes do – it rehashes but fails to better an infinitely superior original. I would probably have liked The Thing 2011 a good deal more if it had been its own film and came without the The Thing pedigree. In that it chooses to do so, one cannot help but compare it to the original at which the remake/prequel merely stands in its shadow. The Thing effects seem routinely wild and way out but lack the true phantasmagoric horror that seeing the original did for the very first time. Air bladder effects have become replaced by CGI effects. Certainly, these do produce some nightmarish creations – notedly the Lovecraftian creature inside the spaceship – but many of them lack the outré vision that John Carpenter gave to each of The Thing’s appearance in the original and seem to be down around no more than the level of tentacles penetrating people’s chests. There are a couple of exceptions where Matthijs van Heijningen Jr. does get the mix right – one being the vision of the Kim Bubbs transforming into an alien maw and then her tentacled female torso trying to dig into and devour the man she attacks; the other being the variation on the spider head walk sequence where the creature this time becomes an entire body spider-walking along and then attaching itself to and trying to meld into a living person lying on the floor. It is here and in the degree of paranoia that Matthijs van Heijningen Jr. evinces in the filling test scene that he demonstrates a good grasp of what John Carpenter did that made the original so unique. Certainly, someone coming to see The Thing 2011 without any prior knowledge of the other film might well come away moderately impressed. Alec Gillis, who provides the makeup effects here, was so annoyed at having his work supplanted bt CGI that he went away and made his own homage to The Thing with Harbinger Down (2015) where the creature effects are all conducted with purely physical effects. Matthijs van Heijningen Jr.has not made another film. The screenplay was one of the early works from Eric Heisserer who also wrote the remake of A Nightmare on Elm Street (2010), Final Destination 5 (2011), Lights Out (2016), Denis Villeneuve’s Arrival (2016) and Bird Box (2018). (Nominee for Best Makeup Effects at this site’s Best of 2011 Awards).